"Medical marijuana," the U.S. Drug Enforcement Administration says, "already exists." They don't just mean in California. A pill known as Marinol has been legal and approved by the Food and Drug Administration for use with a prescription anywhere in America since 1985. It's active ingredient? Dronabinol, better known as THC, the primary psychoactive element of the cannabis plant. "Marinol provides standardized THC concentrations, does not contain the other 400 uncharacterized substances found in smoked marijuana, such as carcinogens or fungal spores, and is not associated with the quick high of smoked marijuana," said Neil Hirsch, a spokesman for Marinol manufacturer Solvay Pharmaceuticals. "If I smoke a joint, the tremors go away most times before the joint is gone," he said. "It makes my life a little easier." Marinol, by contrast, "didn't really do much of anything for me," he said. "I felt no relief, I didn't feel ill, I felt nothing," he said. "It might as well be M&M's." Elton said he switched to marijuana, which he smokes through a vaporizer - a device that heats the active ingredients into a vapor instead of burning them. He said it allows him to keep down his food and regain some of the weight he lost while on Marinol. "[One] problem with Marinol is that it's orally administered," Dr. Mitch Earleywine, an associate professor of Clinical Psychology at the State University of New York at Albany, said in an email. "Therefore, it takes longer to work than cannabis inhaled from a vaporizer. (Usually 90 minutes at best rather than 15 seconds - a meaningful amount of time to the nauseated.)" "It's harder to control dosage, too, so folks end up discombobulated or without symptom relief," he added. "In addition, folks who are vomiting can't hold down the pills." 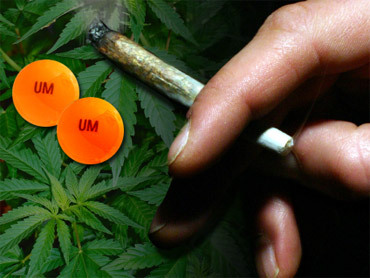 Earleywine also said that a dose Marinol costs three to five times as much as a comparable dose of medical marijuana. "When the whole push for the smoked product came along, it was often for those two indications," said Dr. Herbert Kleber, a professor of Psychiatry at Columbia University and the former deputy drug czar under President George H.W. Bush. "And in general, I've not seen any need for the smoked form of marijuana for those two indications. Marinol had already been shown to be quite effective for those two things." "Are there actions in the whole plant that you don't get from just the Marinol? I would be surprised if there wasn't," he continued. "The problem is that most of the data about the potential medical actions of the smoked form are anecdotal." The Los Angeles Times, which offers a nice overview of the current research, writes that "a growing body of research supports [medical marijuana's] medical usage, but some of it is cautionary." Marijuana has been found to be effective in counteracting severe pain, nausea and loss of appetite, though questions remain about the drawbacks, among them possible respiratory damage and increased cancer risk. Dr. Kleber, who said he has prescribed Marinol to a patient and found it to be effective, points to what he characterizes as a significant advantage of the pill over traditional marijuana: "People don't abuse it." "Marijuana addiction is becoming common and as a result I'm seeing an increasing number of people who have trouble stopping marijuana," he said. "Contrary to popular beliefs that there is no marijuana withdrawal, there is marijuana withdrawal. It's very clear cut." The calculus, then, isn't quite as simple as the Drug Enforcement Administration suggests: Marinol and medical marijuana may share an active ingredient, but they offer somewhat different benefits and different drawbacks. Proponents of medicinal marijuana say it's disingenuous to hold up Marinol as a direct alternative to the more traditional form of the plant. "I just don't understand how they won't let me smoke a joint, but they're more than happy to write me out prescriptions for anything that I want," Trainer said.